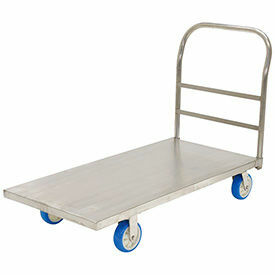 Lakeside® Stainless Steel Platform Trucks allow Easy Transport of Heavy, Bulky Items. 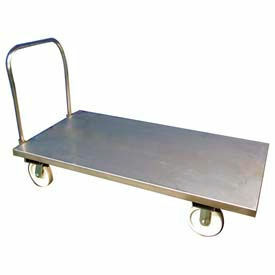 Lakeside® Stainless Steel Platform Trucks are used for transporting trays and food service supplies. Stainless Platform Trucks offer maximum maneuverability and ease of loading and unloading. Single Handle Stainless Platform Trucks include one tubular push handle for easy steering. Includes two 5" swivel casters and two 8" rigid wheels. 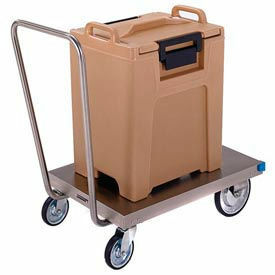 Twin Handle Stainless Platform Trucks include 2 tubular push handles. Moves easily on 5" non-marring swivel casters. Twin Handle Truck is available in a 6-Wheel configuration that includes two 8" fixed center wheels. DC Tech Stainless Steel Platform Truck is for use in Wet or Corrosive Areas. DC Tech Stainless Steel Platform Truck is constructed with rustproof, continuous weld, 14 gauge T-304 stainless steel for long lasting durability and strength. Platform deck is manufactured from a single piece of heavy duty stainless steel material with 2" turned down edges. 38" U-shaped handle is easily removable for storage. 3-piece under carriage provides added strength. Platform is set atop four heavy duty 8" casters, (2 rigid, 2 swivel). No assembly required. Replacement rigid casters and swivel casters are also available. Capacity is 2500 lbs. Vesitl Stainless Steel Platform Trucks are suited for Clean Room Environments, Food Handling, Pharmaceutical Industries and More. These 201 grade stainless steel platform trucks are made with corrosion resistant, non-wearing, temperature resistant, completely hygienic stainless steel roller bearings. Weight capacity is 2000 lbs. Deck lengths are 36", 48", 60" and 72"
Deck widths are 24",30", and 36"